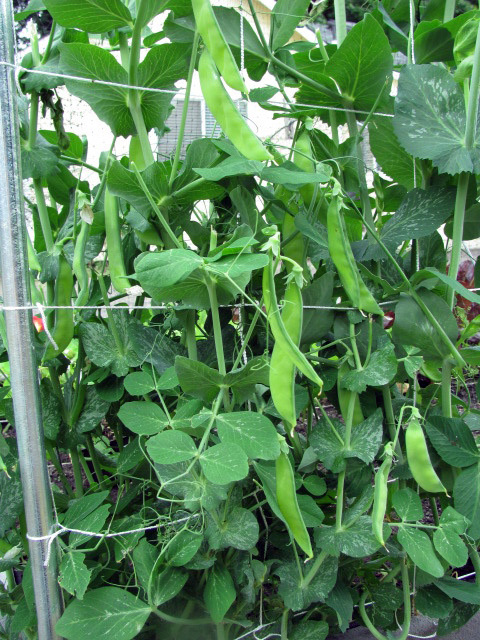 After a rather severe pruning by the neighborhood deer the peas seem to have recovered and are growing like mad! I had my first harvest of snow peas this week and have some sugar snaps right on their heels. I’m realizing quite quickly that next year I’m going to need more garden space. I went with the minimum square footage this year to give me a chance to adapt and work out the kinks, but there just isn’t going to be enough produce to freeze in addition to what we eat. With my first harvest of precious peas I made a coconut basil stir-fry. I talked about this recipe last year but since it’s hidden away on the old site and since I didn’t get any pictures last year I thought it deserved another go. If you haven’t tried “reject carrots” you should. They are the ones that are a little funny looking, more like something I might grow, but are usually dirt cheap! A couple of stands at the Olympia market sell them for a dollar or two a pound compared to four or six dollars for a one pound bag. Every couple of weeks or so I make dinner at my parent’s house for my dad when my mom is out-of-town. Even though I lived in that house for several years I still feels like I’m cooking blind. I get distracted and frazzled when I can’t find things. I am likely to forget ingredient and over cook things. Needless to say it isn’t my best work, however my dad appreciates the effort and it always challenges me to think on my feet and cook creatively. This week, I for got the serrano pepper, which adds a nice flavorful heat to the coconut broth. If you can’t tolerate heat at any level you can leave it out, it tasted fine, but even just half the pepper really adds to the overall flavor of the dish without being to hot. The basil traditionally used in this recipes is bai gaprow, or holy basil which can be harder to find because of its shorter shelf life. Holy basil doesn’t have much taste when raw, but when cooked it becomes strong and distinctive. Asian basil makes a very good substitute, though it can’t be cooked as long or it will lose flavor. It really doesn’t matter what kind of basil you use as long as you don’t let it cook very long. Heat a wok or heavy skillet over high heat until hot. Add oil and heat until hot but not smoking. Add garlic and stir-fry until golden. Add chicken and cook, stirring constantly to prevent sticking. Add fresh grated ginger. Add veggies and cook until all chicken is opaque white, 3 to 4 minutes. Combine chilies, broth or water, fish sauce, sugar, soy sauce, and black pepper in small bowl. 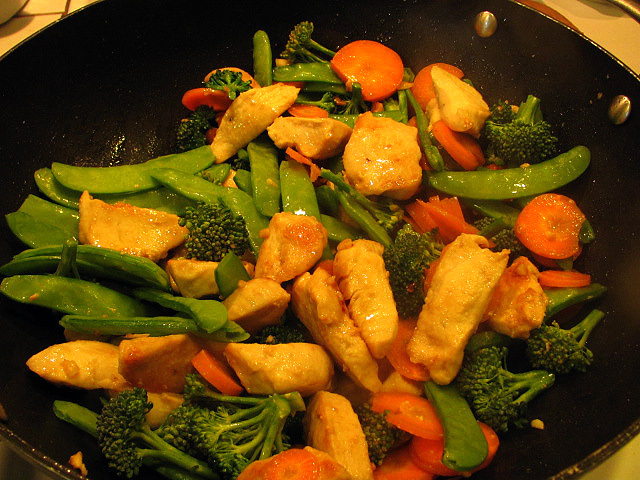 Add sauce and coconut milk to stir-fry. Allow to cook for a few minutes to thicken the sauce. Just before serving add basil and stir-fry 30 seconds, don’t over cook. Stir in lime juice. Serve over rice and limes on the side. This entry was posted in entree, Farm-to-Table, poutry, Quick dinner, Recipe. Bookmark the permalink.